A friend of mine recently told me I would need some more movie reviews for folks like her on my blog, since she is a hardened movie addict. I meant to write a review of Toy Story 3 a few weeks ago, when I actually saw it, but then I ran out of time before Camp. I saw the first two Toy Story movies back when they were new, or at least newer. I loved the concept – not just because you get to see retro toys, like ones I actually owned as a kid, brought to life, but also because I was always a believer in the secret lives of my toys. It made perfect sense to me that they would have feelings, want to be played with, and have adventures on the sly. The movies were very entertaining and satisfying. 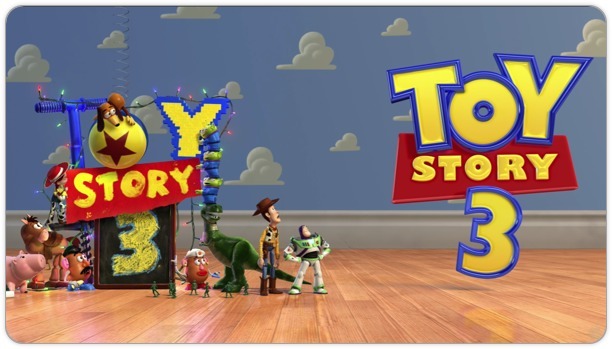 Toy Story 3 is no exception. (I was thrilled to see that old Fisher-Price phone with the bobbly eyes, looking beat-up and well-played-with just like ours did.) It’s a movie with great jokes for kids and adults, in typical Pixar style. (The Buzz Lightyear dance sequence cracked me up – so well done!) The uses they put those toys to are creative and awesome and just… bang-on, to the point that Sean and I were shaking our heads in amazement. The 3D part was cool, although I think it would have been just as good without it. But what really blew me away was the genuine emotion in Toy Story 3. Anyway, Toy Story 3 (and I’m not really giving anything away here) focuses on the same child as the first two movies do, except he’s grown up and going to college. Oh boy. Sean leaned over at one point when Andy’s mom is getting a bit emotional that her son’s all grown up, and whispered, “You ready for that, honey?” NO!! And I may never be. But I do hope I raise a kind and lovely boy in this confusing world – I consider this the challenge of a lifetime, and extend awed kudos to my own parents and aunts and uncles and dear friends who have done so. The point is, I got a little teary at the juxtaposition of childhood and adulthood and all that jazz. Pixar made me do it – on purpose! Conclusion: I put up all the thumbs available to me for this feature. Go see it! i presume you’ve seen Monsters, Inc, too – also delightful animation, fun ideas, and a pretty good message. but the finest moment is when the girl re-enters her own room and does a little stampy-foot dance – so like a real little kid! Yeah! That little girl is so great! Thanks! I can’t believe you did this review so quickly! I agree that this was a great movie. I also agree that it would be just as good in 2D – which means it will be a welcome addition to any home movie collection. Keep up the great work!